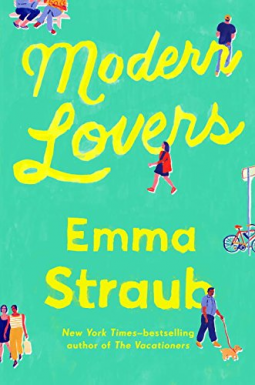 Modern Lovers is the second of Emma Straub's novels that I have now had the pleasure of reading and I hope it won't be the last. Elizabeth Marx, her husband Andrew, and their best friend Zoe are stunned when approached by an agent looking to make a biopic about their former band mate and college friend, Lydia. Those days seem so far behind them now. Those carefree days of drinking, party's, gigs and slate night songwriting sessions. Now each have their own kids; Elizabeth and Andrew have 17 year old Harry and Zoe and her wife Jane have 18 year old Ruby. They are all successful, Elizabeth as a real estate agent, and Zoe and have a restuatant together. Andrew is also the only one of them who is reluctant to sign on the line for the movie. Is it a coincidence that he currently seems to be going through some sort of mid life crisis? Modern Lovers explores the way in which a past you thought was left far behind can suddenly appear out of nowhere and bring you challenges all over again. A great novel with some lovely (and some not so) characters. I look forward to Emma Straub's next. Modern Lovers is available from 30 June 2016.